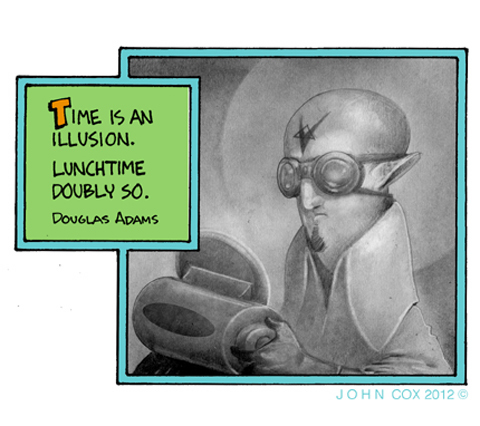 Therefore life, being made of time, is an illusion. Beldar scanned his protein dispenser menu for new ideas. Gasperix with lemon sauce au graten was so yesterday. Hmmmm....perhaps this new entree, Solylet Green. Must be vegetarian. Been going through my own time hell. Last week was in Romainia...taking back off for Alaska. My mind is twisted. That's why I haven't been on lately...ARGHHHH! Sounds a bit rough. Hang in there. Up a bit late aren't y0u! LOL about the time thing. Or is that when the creative juices start flowing? I'm in Evergreen this evening. Thank God! I usually hit the hay around 2am. Gets all my best drawing in late. ...unless, of course, I can court your vote with divisive rhetoric and a few bucks." This page contains a single entry from the blog posted on February 23, 2012 4:10 PM.